I first met John Stott somewhere between 1986-1987 after he had given a message at a Chapel service at what was then called Multnomah School of the Bible (now Multnomah University) in Portland, Oregon. After he spoke he stayed for lunch and ate in the cafeteria. I was privileged to sit with him and hear his wisdom for over an hour. I was impressed with his humility, knowledge of the Scriptures, and genuine concern for us students. Two years later I was returning from spending two months in Spain on a missions trip and met up with my parents in London for a few days. While there we worshiped at All Souls Church in London and worshiped and listened intently as John Stott delivered a wonderful Christo-centric sermon from Isaiah. Afterwards while waiting in a very long line to greet “Uncle John” he said to me without hesitation, “Hello David, how is your ministry at Multnomah going?” I couldn’t believe that he remembered my name, my ministry (with junior highers at the time), and where I was going to school! Needless to say, I was dumbfounded. I have always held Stott’s commentaries, books, and ministry in high regard – but what I loved most about Stott – was his genuine love for, and ability to shepherd like the Chief Shepherd – not just his local sheep, but around the world. I have taken random samples of tribute from Stott in this short article – many are from memorial services held for him around the globe, and some are from tributes in various venues. May John Stott’s tribe increase! We miss you Uncle John! 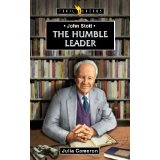 As I write this review it’s been one year since John Stott went to be with the Lord – July 27, 2011. A tremendous loss for the Church in the world – Heaven’s gain! I can’t recommend this book highly enough for would-be pastors; pastors; Bible scholars; missionaries; church leaders of all stripes; and world Christians across the globe. John Stott was absolutely brilliant; wholeheartedly dedicated to his flock as an under shepherd of Christ; a first rate Bible scholar; an expositor of the first order that was able to bridge the Biblical world with our own with total authority, sufficiency, and relevancy; and an unheralded disciple maker of leaders of all ethnic groups around the globe. He was a tireless worker with students, scholars, pastors, missionaries, and leaders for the furtherance of the gospel and the strengthening of the church around the globe. In my opinion – he was the model modern pastor – missional (he multiplied disciples, leaders, and multiplied movements for gospel multiplication) pastoral, loving, humble, scholarly, fully committed to the work and message of Christ. I only hope that there will be more pastors like him until the return of Christ – pastors that don’t play politics; pastors that love and shepherd the flock whether they are rich or poor (he had a tremendous heart for the poor as recounted in this book); pastors who study hard to feed their flock the milk and meat of the Word; pastors who love and train young leaders; pastors who are humbled and submitted to the Lordship of Christ – and preaching nothing but the cross of Christ! I hope that many will read this book and be humbled and dedicated to the Chief Shepherd – as Stott was! I miss him terribly, and long for those of his ilk.